Rep. Darrell Issa, the top Republican on the House Oversight committee, told CBS News Wednesday that he will call for a special prosecutor to investigate the White House if it does not address Rep. Joe Sestak's claim that he was offered a federal job in exchange for dropping out of the Pennsylvania Senate primary. "If the public doesn't receive a satisfactory answer, the next step would be to call for a special prosecutor, which is well within the statute," Issa (pictured) told Hotsheet. The California Republican has been pushing for the White House to provide details of conversations between Sestak and administration officials in the wake of Sestak's comment during a radio interview last month that he was offered a high-ranking administration job in exchange for dropping his primary challenge against Sen. Arlen Specter. Asked if that job was secretary of the Navy, Sestak declined to comment. His press secretary told CBS News that the lawmaker stands by his original statement that he was offered the job in exchange for an administration post. Sestak did not drop out of the race. On March 10th, Issa sent a letter to White House lawyer Robert Bauer asking for details about communications between Sestak and the White House. In the letter, he pointed to statutes he said could have been violated if Sestak was offered a quid pro quo arrangement in which he would be given an administration job in exchange for leaving the race. Issa said the move may have violated anti-bribery provisions of the federal criminal code as well as prohibitions on government officials interfering in elections and using federal jobs for a political purpose. Violation of each provision is punishable by up to one year in jail. The White House did not respond to Issa's letter by its March 18 deadline. Reporters have asked White House press secretary Robert Gibbs about the inquiry on six occasions. On February 23rd, Gibbs said he had not looked into the matter. On March 1st, he said he had not made any progress on it. On March 9th, he said he did not have an update with him. On March 11th, he said he did not have anything additional on the matter. On March 12th, he said he did not have any more information on it. On March 16th, Gibbs finally addressed the situation. "Look, I've talked to several people in the White House; I've talked to people that have talked to others in the White House," he said. "I'm told that whatever conversations have been had are not problematic." On Monday, Issa issued a second letter asking who Gibbs had spoken to about the matter and the basis for his comment that the interactions between the White House and Sestak were not problematic. In the letter, Issa said that Gibbs' comments that he is "collecting direct evidence from witnesses" implies "that the White House is allowing its communications staff to carry out investigative tasks ordinarily conducted by legal professionals in the Counsel's office. Such slipshodness has all the makings of a cover up." 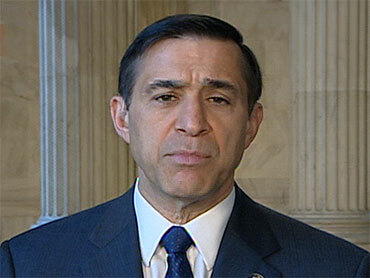 In an interview Wednesday, Issa stood by the notion that the White House is engaged in a cover up. "I believe not answering our questions when in fact they have asked and gotten them answered" meets the standard for a cover up, he said. He compared the Obama White House to that of former President Richard Nixon and said it was not living up to its promises of transparency. "Democrats, when they were not in the White House, had real objections to that idea of, 'whatever I want to do is OK,'" he said, referencing objections to Bush administration policy. "The public has a right to know who asked what, when. A congressman has made an allegation that is likely a felony." Issa said that if he doesn't receive "satisfactory answers" to his letter by its April 5th deadline, "then the next step would be to call for a special prosecutor to investigate." He said it is now "a lot easier" for the White House to respond because Gibbs "has the raw information that we asked for." Asked if he expected his call for a special prosecutor to be answered, Issa said, "I'm a practicing Christian, I have always believed in the redemption of souls." He said that if the issue generates enough publicity Democrats may feel forced to appoint a prosecutor out of "the fear of the voters." Issa said that while backroom dealing is not uncommon in politics, an explicit quid pro quo arrangement crosses the line, and that there is no way to know exactly what happened until either Sestak or the White House provides details. Asked why he was taking up the fight, he pointed to efforts by Democrats on the House Oversight committee to examine Bush administration e-mails and the Valerie Plame matter and said he had the right to look into any potential violation of the Hatch Act. "I'm not going to let this issue go away between now and November until it's resolved," Issa said. "I think an unanswered allegation of a criminal activity is one that even a back burner boil will eventually lead to steam rising," he added. "I don't believe the question will stop being asked until original source information is delivered." Asked if he wanted to comment on Issa's intention to seek a special prosecutor in the case, Gibbs said he would say "nothing more than what I said last week."